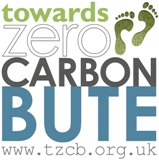 Towards Zero Carbon Bute (TZCB) is an island wide project for Bute residents of all ages, and for organisations to help us all to reduce our impact on climate change. The project is organised through Fyne Futures, the sustainability subsidiary of Fyne Homes, with funding from the Scottish Government’s Climate Challenge Fund. We are here to help all residents and organizations on Bute to reduce their carbon footprints, to minimise their energy bills, and to reduce their costs from transport. We can help you find grants, make your home more energy efficient, provide information on in-home energy generation such as wind turbines and solar panels, as well as giving you more sustainable transport options. We can also tell you more about our two Fyne Futures sister projects which can help with recycling and provide locally grown vegetables and fruit. If you are a business, community group, or charity with a building we can visit you to show you how to reduce your energy bills, and thereby increase your profit or surplus. Just contact us to book an appointment (free of course like everything else that we do). If you are a primary school pupil, or a parent of one, we can help you reduce your travel costs by encouraging pupils to travel to school in a more sustainable way. We are working with the three primary schools. Get in touch with your teacher for more information. If you aren’t based on Bute, feel free to make use of this information but unfortunately we can’t help you in terms of carrying out home audits or carbon footprints. However look on the links page for other Climate Challenge Funded projects which may be able to help you in different areas of Scotland.